British police spied on senior Labour politicians during the 1990s, keeping extensive records of personal and political affairs, a former undercover officer has revealed. 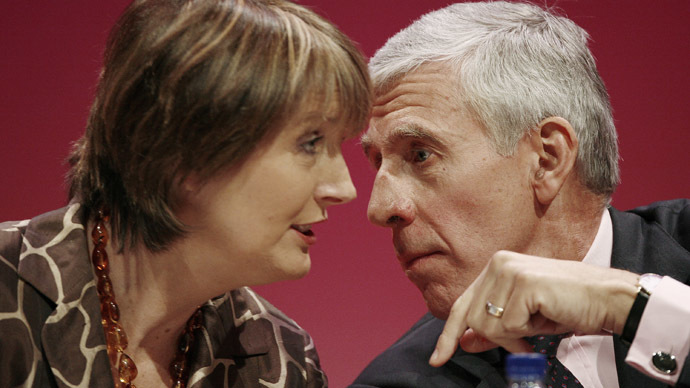 Whistleblower Peter Francis claims he read secret files about several Labour ministers, including former Foreign and Home Secretary Jack Straw, current Deputy Leader Harriet Harman, and former Cabinet Minister Peter Hain. Francis said he had personally monitored three MPs – Diane Abbot, Jeremy Corbyn and the late Bernie Grant – while working for the Metropolitan Police’s Special Branch. Francis told the Guardian secret files on politicians were “very extensive,” covering political beliefs, demonstrations they attended, and personal information about their parents, school and finances. While working for the Special Demonstration Squad (SDS), a unit of Special Branch, Francis spied on anti-racist groups and activists including Abbot, Corbyn and Grant. This included attending meetings and demonstrations which the three Labour MPs spoke at. “I was there and they were talking about things and that is what I reported on,” he told the Guardian. Shadow Home Secretary Yvette Cooper called for the claims to be investigated as part of an inquiry soon to be led by a senior judge into undercover policing carried out by SDS. “These are extremely serious and disturbing allegations. Lord Justice Pitchford's inquiry must be extended to look into these as part of the investigation into the activities of the special demonstrations unit of the Met,” the Labour MP said. Deputy Prime Minister Nick Clegg echoed Cooper’s call for the Pitchford inquiry to look into the allegations. “I know there's an inquiry into undercover police tactics and I very much hope it will look at these allegations because they are not the kind of thing you want in a free society,” he added. “That the special branch had a file on me dating back 40 years ago to anti-apartheid and anti-Nazi League activist days is hardly revelatory. That these files were still active for at least 10 years while I was an MP certainly is and raises fundamental questions about parliamentary sovereignty,” Hain wrote in the Guardian. I'm writing to Home Sec today demanding to see security services file on me. Govt must not cover up when security services do wrong! Hain called on Home Secretary Theresa May to set up a public inquiry to investigate covert surveillance of MPs by police. In addition to senior Labour ministers, Francis alleges Scotland Yard also spied on the late Tony Benn and Ken Livingstone, who was a Labour MP before becoming mayor of London in 2000. “Did they think we were a threat to the Western system? If only this were true. What a load of crap. What’s so ridiculous is that we were being subjected to IRA bombings right the way through that period and they were wasting officers spying on me and Tony Benn,” Livingstone said. “It’s a complete waste of police resources. People like me and Tony Benn were sadly never a threat to capitalism because we never had the powers. “I’d love to see the files. My kids would love to see the files. They’re most likely full of rubbish,” he added. Francis made similar disclosures in 2013, when he revealed how the SDS monitored the relatives of Stephen Lawrence, a black teenager who was murdered in a racially-motivated attack in 1993. The SDS has come under scrutiny in recent years, after former police officers revealed how the secret unit infiltrated activist groups for more than 40 years. Some undercover officers formed sexual relationships with women, even fathering children with them. An internal police inquiry, Operation Herne, is investigating the Met’s shady record of covert intelligence gathering. “Whilst talking openly about undercover policing is challenging because of its very nature, the upcoming inquiry represents a real opportunity to provide the public with as complete a picture as possible of what has taken place,” he added.